After textile mills began disappearing in the United States, Bayside made a commitment to producing and manufacturing the finest printable apparel at competitive prices. 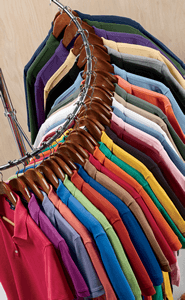 Since 1994, they continue to make high quality, die-cut garments on their automated cutting and pocket setting machines, complete with American workmanship and fine fabrics all sourced and manufactured in the U.S.A. T-shirtwholesaler.com is proud to offer you t-shirts, long sleeve shirts, hats, beanies, fleeces, and totes from the largest supplier of American-made blank apparel. The manufacturing process utilized by Bayside creates unparalleled consistency in sizing and coloration, minimizing defects that impact customers down line. Die-cut garments are electronically monitored and cut to ensure each and every shirt in that batch is exactly the same. So, when you need a hundred bright Bayside BA5100 6.1 oz. Basic T-Shirts at wholesale prices for your fundraiser, your shirts will be ready to be printed with your logo and sized correctly the first time. Universally fitting baseball hats, like the Bayside BA3621 Brushed Twill Structured Sandwich Cap, are customizable and look sharp. By using high-quality American fabrics, Bayside ensures the tightness of the knit and consistency is appropriate for graphics to be applied to a smooth, durable surface. In addition to traditional apparel, we also offer a wide range of yellow and orange safety-colored Bayside shirts, appropriate for a wide range of work applications. We even have fleece hoodies in traditional and safety colors. Handled totes make universally practical corporate gifts, team gear, and are easily adapted for promotional use. Cuffed and uncuffed beanies work well with embroidery processes, while functioning to keep you extra warm. When American manufacturing matters to you and your company, Bayside and T-shirtwholesaler.com stand behind the quality and message you deliver.